Links to this page can be found in Book 10, Map B3, Day 1, View C9 and Rione Campitelli. 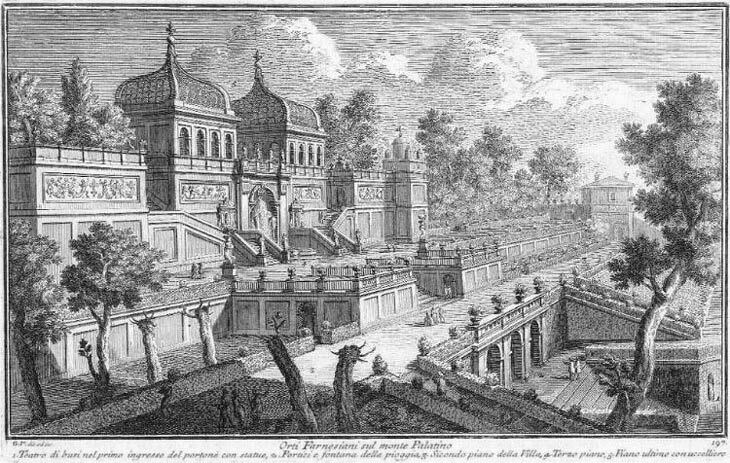 When Giuseppe Vasi published this etching in 1761 Orti Farnesiani, the Farnese Gardens on the Palatine Hill, had already entered a long period of decline. In 1845 Rev. Jeremiah Donovan wrote in Rome Ancient and Modern: In the XVIIIth century the male branch of the Farnese family became extinct, and the Orti descended to Elizabeth Farnese, Queen of Spain and thus became the property of the Bourbon of Naples, who transferred their artistic treasures to Naples and suffered the villa to fall into decay, insomuch that in the wide extent of the hill the destruction is the most complete. In 1761 Ferdinand IV, King of Naples, was a boy of ten and the country was run by a regency council whose members had no interest in pouring money into the maintenance of Orti Farnesiani. The view is taken from the green dot in the small 1748 map here below. In the description below the plate Vasi made reference to: 1) First entrance; 2) Porticoes and Fontana della Pioggia; 3) Second floor; 4) Third floor; 5) Aviaries on the top floor. The small map shows also 6) Entrance to Villa Spada (Mattei); 7) S. Sebastiano al Palatino; 8) S. Bonaventura. 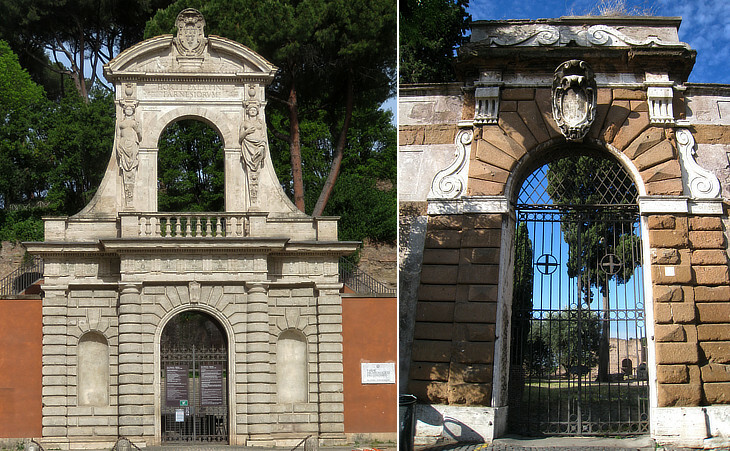 The main gate of Orti Farnesiani was situated on Stradone di Campo Vaccino which was thoroughly excavated in the second half of the XIXth century to unearth the ruins of the Roman Forum. The upper section of the stairway leading to the aviaries is the only remaining part of the buildings/gardens depicted in the plate. 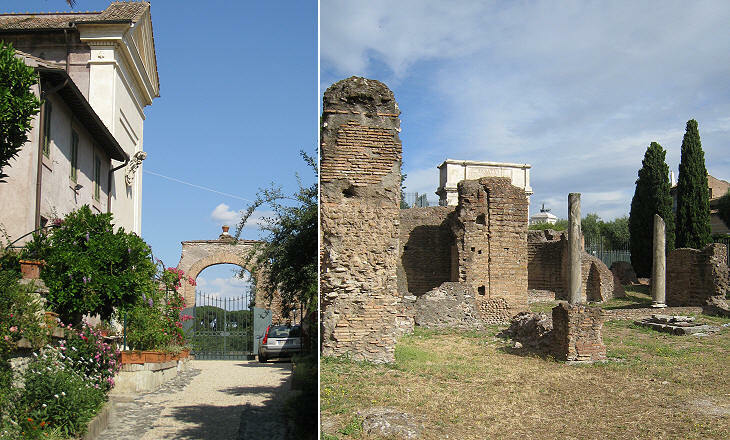 Today it is part of the archaeological area which includes both the imperial palaces and the Roman Forum. 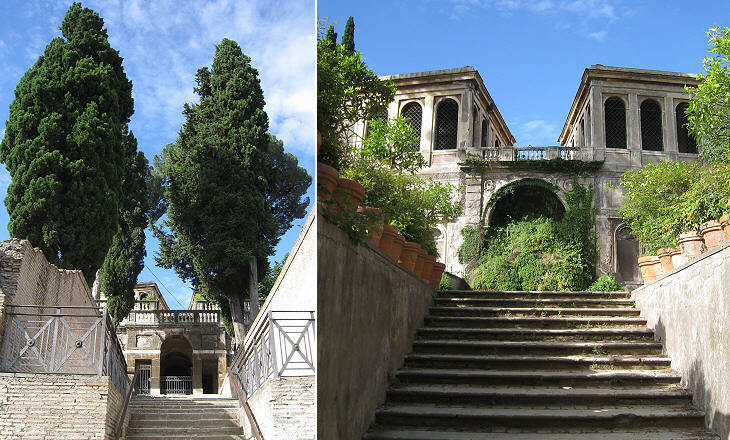 (left) Stairway leading to the Fontana della Pioggia (Fountain of the Rain); (right) stairway leading to "il Fontanone"
One of the first decisions taken by Pope Paul III after his election in 1534, was to give the cardinal's hat to his grandson Alessandro, who was aged fifteen. Cardinal Alessandro Farnese played a major role in assisting his grandfather and his successors. 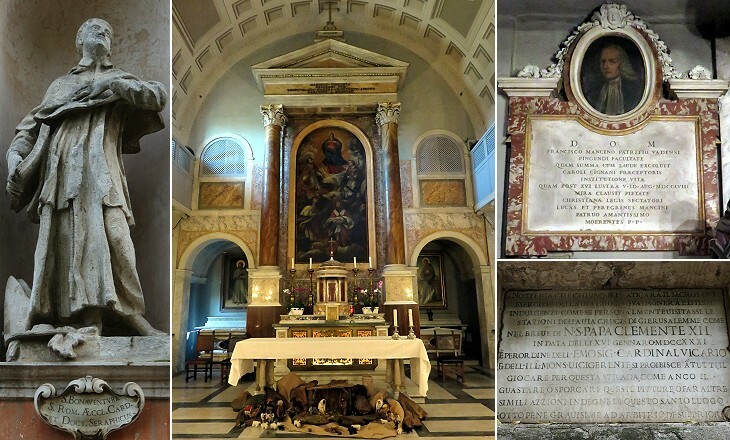 He was a great supporter of the Jesuits (he built il Gesù), a great collector of works of art and a capable advocate of the interests of his family. 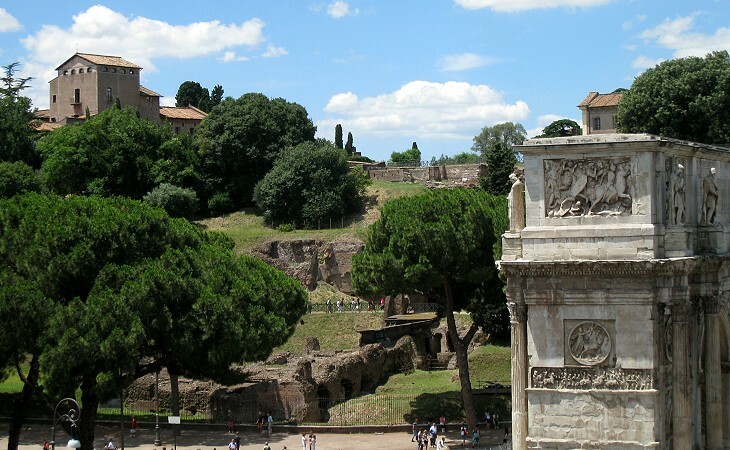 The Farnese had a large palace in Rione Regola and a villa at Caprarola, but Cardinal Alessandro Farnese, who was a man of the Renaissance and therefore very fond of the ancient past of Rome, decided to buy several parcels of land overlooking the site of the Roman Forum. 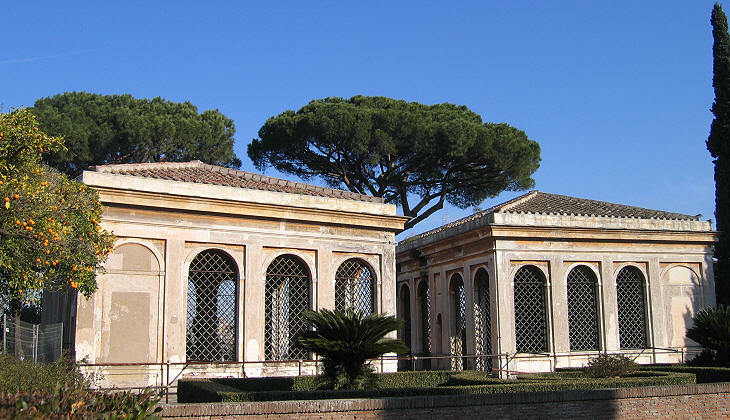 He then commissioned il Vignola with the design and construction of a summer residence for the Farnese. It was called Orti, rather than villa, because this was the word used by the ancient Romans for their suburban residences (e.g. Horti Sallustiani). A feature of Italian Renaissance gardens was the attention paid to symmetry and perspective; similar to Villa d'Este, Orti Farnesiani had a series of terraces linked by stairways which were flanked by trees and decorated with statues. In order to escape the heat of summer the ancient Romans used natural or man-made caves as a shady recess which they embellished with statues: Emperor Tiberius recreated Polyphemus' cave at his villa by the sea near Sperlonga and caves can be seen at Emperor Nero's villa at Anzio. In the lack of natural caves, Italian gardens had man-made grottoes which were often given the appearance of a nymphaeum, an ancient Roman monument dedicated to nymphs of springs (e.g. Ninfeo di Egeria) and thus they had a source of water; the caves were designed in order to receive some natural light. The fountains were added in the XVIIth century by Girolamo Rainaldi when the supply of water to the Palatine was restored. Because the water pressure was low, the fountains were not of the spouting type, but "sweating" ones, where water flowed on the surface as sweat does on the skin (similar to Meta Sudante, an ancient Roman fountain). The ogee domed roofs of the aviaries are lost. They were made of iron similar to those at Villa Borghese. 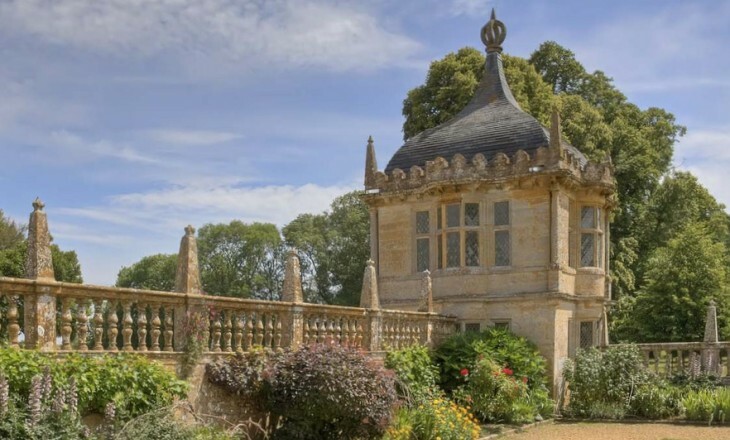 They resembled the roofs of two pavilions (it opens in another window) in the gardens of Montacute House, an Elizabethan mansion in South Somerset. In 1861 Francis II, the last King of Naples (more correctly of the Two Sicilies), sold Orti Farnesiani to Emperor Napoleon III of France. The Italian government acquired the property in 1870 and it started a systematic plan of excavations to search for the ancient imperial palaces. 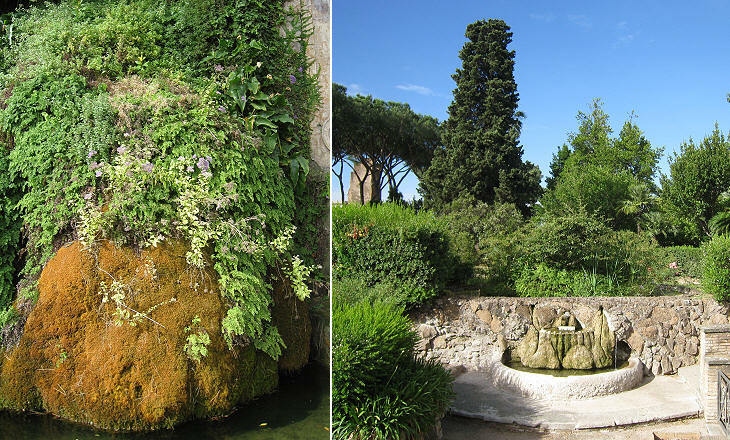 We know that a section of the Farnese gardens, known as Giardino della Palma, was dedicated to exotic plants from America and Africa. In the design of the archaeological area an attempt was made to partially recreate it. 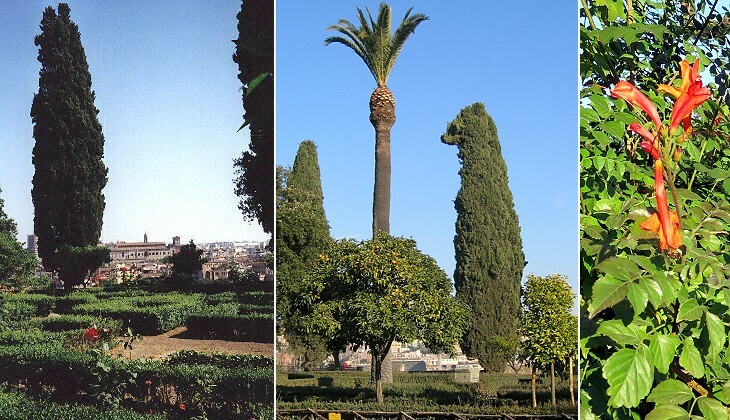 Giacomo Boni, one of the archaeologists who led the excavation campaigns on the Palatine wanted to be buried in this garden; his tomb is at the foot of a tall palm. 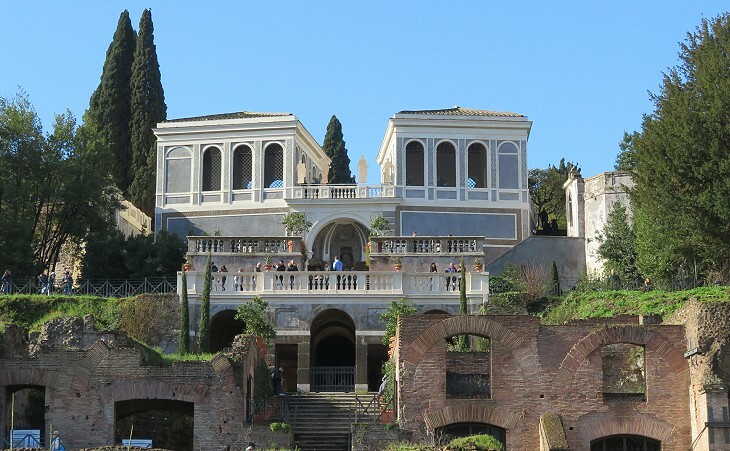 The modern garden stands on a terrace of Domus Tiberiana, one of the imperial palaces, which enjoys commanding views over the Capitoline Hill, the Roman and Imperial Fora and the Quirinal Hill. 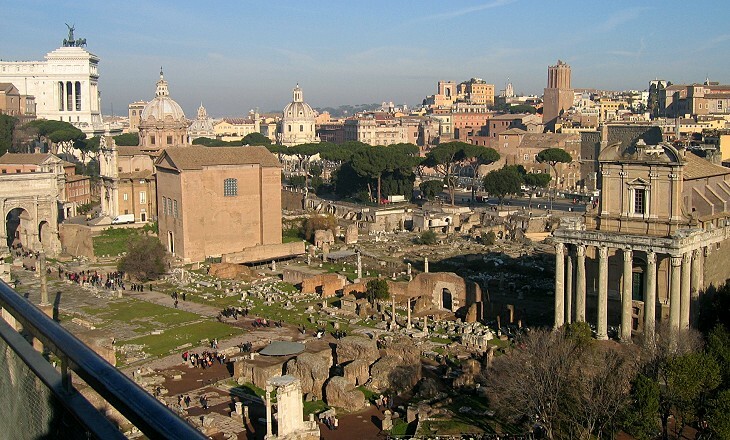 You may wish to see a page on the terraces/sites of Rome which enjoy commanding views. 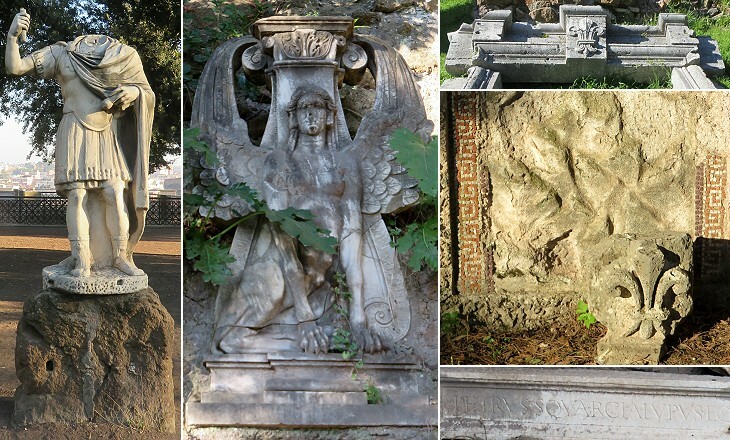 All the ancient statues which decorated Orti Farnesiani were moved to Naples or sold, so those one sees near the aviaries and the modern garden come from the storehouses of Museo Nazionale Romano. Here and there one notices see some fleurs-de-lis, the heraldic symbol of the Farnese which is shown also in the image used as background for this page. 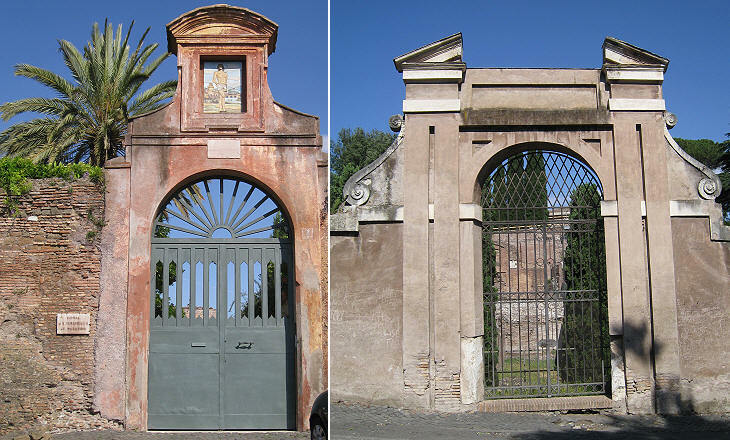 The main gate of Orti Farnesiani was situated on Stradone di Campo Vaccino. It has been relocated to Via di S. Gregorio, opposite S. Gregorio Magno, and it serves as the grand entrance to the archaeological area. 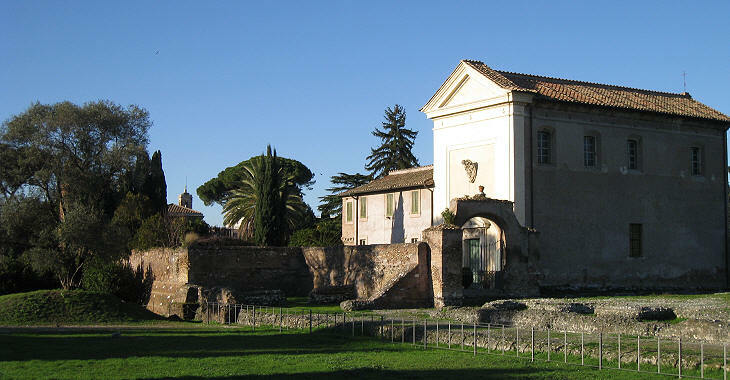 Orti Farnesiani did not include the whole of the Palatine Hill; its southern side, that facing Circus Maximus, was part of Villa Mattei; later on this section of the villa was sold to the Spada. 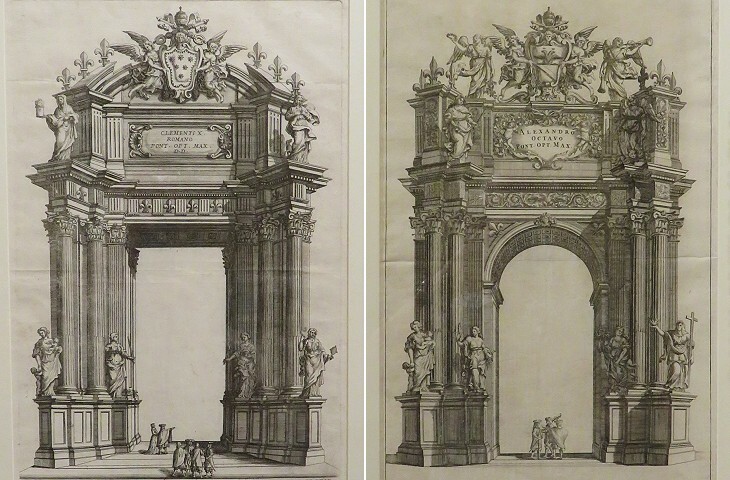 In 1644 the Farnese built an ephemeral triumphal arch next to the main gate of Orti Farnesiani to celebrate the possessio of Pope Innocent X (the procession which accompanied the newly elected pope from the Vatican to S. Giovanni in Laterano. It became a tradition and leading architects were involved in their design. The last arch was erected for the possessio of Pope Pius VI in 1775. The Barberini owned another (minor) portion of the Palatine; it was not a villa, but a vigna (vineyard) on an artificial terrace built by Emperor Tiberius; the gate of Vigna Barberini is decorated with a modern painting (on ceramics) portraying the martyrdom of St. Sebastian, because it serves as entrance to the church by the same name. 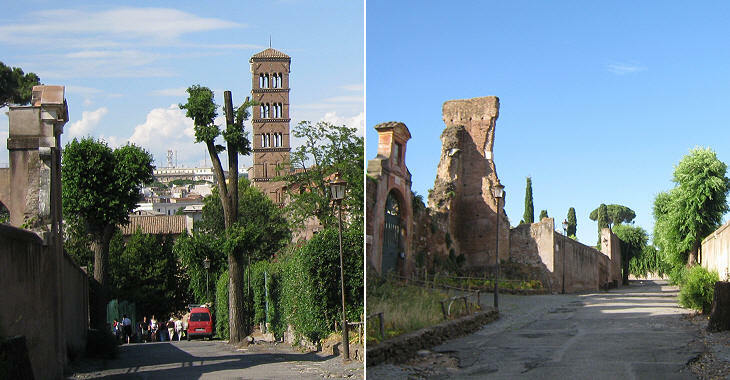 The small churches of S. Bonaventura and S. Sebastiano al Palatino were spared by the excavations and, although being surrounded by the archaeological area, they can be accessed without entering the latter. 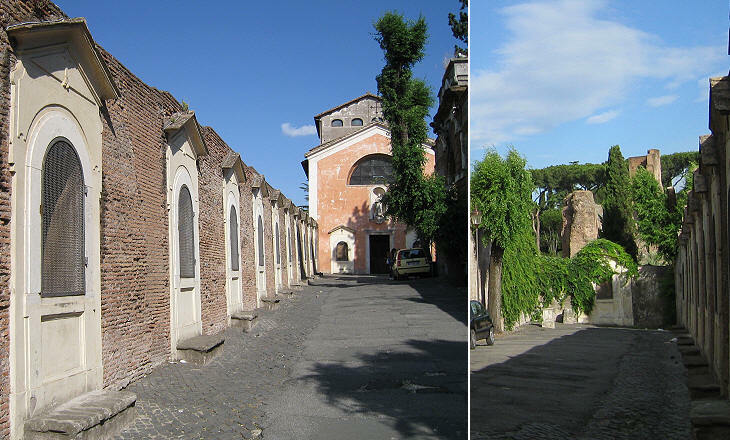 Via di S. Bonaventura, the almost hidden street leading to the two churches, gives a pretty good idea of how most of the eastern and southern parts of Rome appeared to an XVIIIth century traveller: isolated churches, Roman ruins and high walls surrounding large villas. You may wish to see some other similar streets of Rome. S. Sebastiano was built in the Xth century on a Roman temple dedicated by Emperor Heliogabalus to the Sun. The church and the adjoining monastery were protected by walls and towers. The area was abandoned when in 1630 Pope Urban VIII acquired it and rebuilt the church. It was designed by Luigi Arrigucci, a state architect, who at the same time was working at the redesign of SS. Cosma e Damiano. There was nothing however in which he (Nero) was more ruinously prodigal than in building. He made a palace extending all the way from the Palatine to the Esquiline, (..) the Golden House. Its size and splendour will be sufficiently indicated by the following details: (..) the main banquet hall was circular and constantly revolved day and night, like the heavens. The Lives of the Twelve Caesars by C. Suetonius Tranquillus published in the Loeb Classical Library, 1914. Archaeologists have looked for this circular hall for ages. Eventually in 2009, some of them came to the conclusion that it stood on the terrace of S. Sebastiano. The revolving mechanism had the purpose of allowing Nero's guests to admire the night sky, but the site had also a commanding view over the pond where eventually the Colosseum was built. There are records saying that the oldest church on the Palatine was called S. Cesario in Palatio, probably a corruption of Aedes Caesarum in Palatio, the terrace built by Emperor Tiberius; the exact location of this church was forgotten and eventually in the XVIth century this name was given to S. Cesareo at the beginning of Via Appia. Rodolfo Lanciani, one of the most important archaeologists of the XIXth century, thought he discovered the site of the old church at the foot of the terrace, but other archaeologists think that it was inside Villa Mattei. The last stretch of the street is flanked by XVIIIth century Stations of the Cross; it leads to the church of S. Bonaventura which was built in 1677 by Blessed Bonaventure of Barcelone (Michele Battista Gran), a Spanish Franciscan friar. The church was built on the site of a large Roman cistern. You can see its structure from the archaeological area. Next plate in Book 10: Teatro di verdure nella Villa Corsini alla Lungara. Next step in Day 1 itinerary: Chiesa di S. Maria Liberatrice. 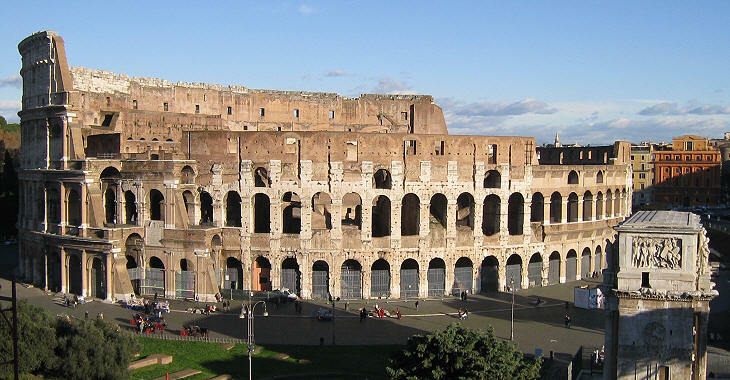 Next step in your tour of Rione Campitelli: Colosseo. Sopra il celebratissimo monte Palatino, o per dir meglio sopra le rovine del palazzo Imperiale, furono questi deliziosi giardini, eretti da Paolo III. col disegno del Buonarroti proseguiti da Giacomo Barozio, che vi fece il nobilissimo portone, e poi terminati da Giacomo della Porta. 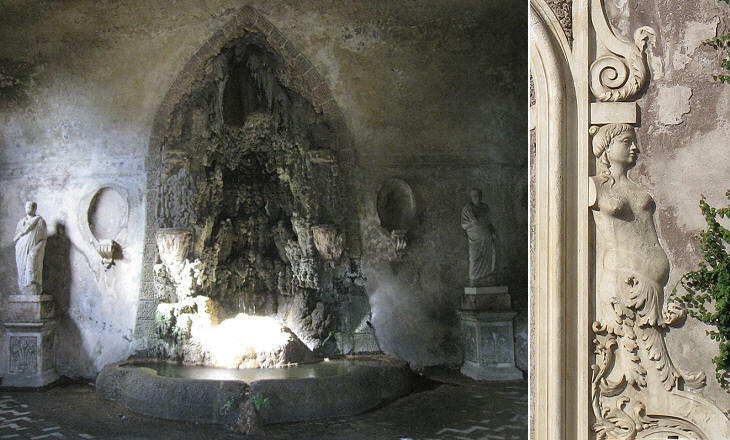 Tra le fontane, la più magnifica è quella della pioggia, e tra le statue tiene il primato quella di Agrippina madre di Nerone, lavorata con tanta arte, che vi si conosce il soprapensiere, e la malinconia di dover morire. , cognominata in Pallara, già che si vede nella salita a destra, eretta per conservare la memoria di essere stato ivi martirizzato; e poco più oltre la Villa Spada con maravigliose rovine del palazzo Imperiale, e poi la chiesa, e convento di s. Bonaventura.